Set along the seafront of Turkey’s south western coast, the Happy Elegant Hotel is the ideal place to head to for a beach break. Enjoying views across the Mediterranean coast, as well as the town of Alanya and its historical castle, the hotel is ideally located for exploring the area. 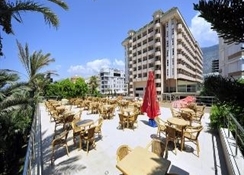 Alanya’s center sits just seven kilometers away, and Mahmutlar is only a kilometer from the hotel. On-site facilities include a 24 hour reception desk, check out service, currency exchange service, lift access to the upper floors, hairdressers, games room, TV lounge, internet access (local charge), conference facilities, room and laundry service (charges apply) and car park. Dining options include a restaurant with both indoor and outdoor seating, A la Carte restaurant and there is also a beach, lobby bar, disco bar and poolside snack bar. Further amenities include a outdoor swimming pool with waterslides, indoor swimming pool, sun terrace with sun beds, Spa Centre with Turkish bath, steam room, sauna and massage service (charges apply), kids club, fitness centre, table tennis, mini golf, beach volleyball and tennis. 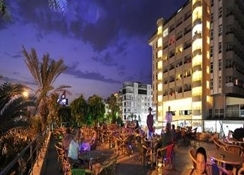 There is also access to the beach via a underpass from the hotel, where there guests will find sun beds and watersports. The Happy Elegant Hotel consists of 218 rooms offers a range of rooms and suites, and most come with views across the ocean. 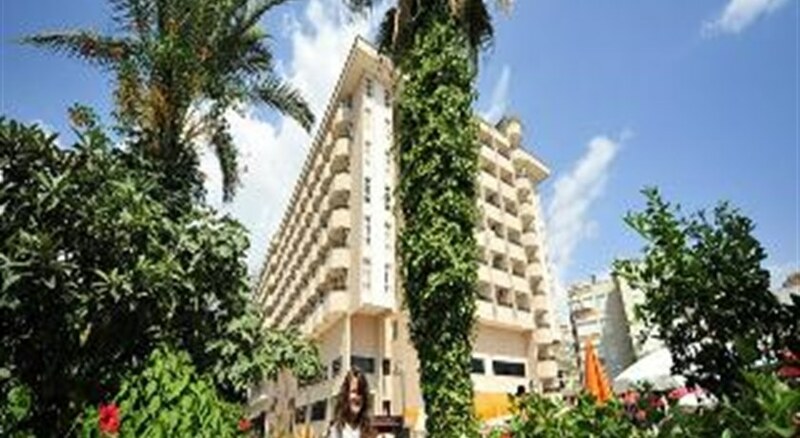 Every room comes with air conditioning, satellite TV, a hairdryer, telephone and a private balcony. Certain amenities may be payable locally. Internet and safe extra charge. 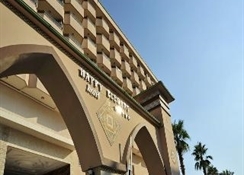 The hotel’s main restaurant serves buffet meals throughout the day, and the A la carte restaurant is there for some delicious international food. With four bars to choose from you can enjoy drinks on the sand, by the pool, in the lobby or even overlooking the view from your balcony. 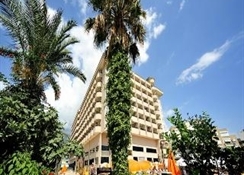 The Happy Elegant Hotel is positioned next to the beach and only approximately 8 km from the resort of Alanya where there is a good choice of shops, bars and restaurants. Antalya airport is approximately 130 km away from the resort of Mahmutlar.